Michael Fallon has reaffirmed the UK’s relationship with France as 1,000 British and French personnel prepare for a joint exercise. Soldiers of the First Battalion the Duke of Lancaster's Regiment from 4th Mechanized Brigade, are pictured training with the 2nd Regiment the French Foreign Legion in 2014. During his first visit to Paris since the General Election, Mr Fallon met key personnel including his counterpart Jean-Yves Le Drian for discussions about the UK’s continuing global role and shared global threats. There was also focus during this visit on the upcoming UK Strategic Defence and Security Review, with the Defence Secretary reassuring French colleagues that the UK will seek to collaborate on areas such as operational synergies. House treaties. Tri-service personnel will operate from two headquarters in France and one at-sea command in the Royal Navy’s largest warship, HMS Ocean. Mr Fallon also met members of the French equivalent of the Commons Defence Committee and its French Senate counterpart, which last met with the UK committee in October to discuss the future of defence strategy. In discussions with French parliamentarians he said that he would look forward to discussing the published SDSR with French parliamentarians in early 2016. Monsieur Le Drian and I have continued our discussions surrounding the major Defence and Security issues facing our nations. We are aware of the complex and challenging nature of the international and domestic security environment and have discussed the shared implications for defence presented by the challenge of global terrorism. I wish to reinforce our commitment to bilateral defence cooperation under Lancaster House; over the next 15 months major exercises will take place in France and the UK, which will fully validate our ability to deploy and operate our Combined Joint Expeditionary Force. 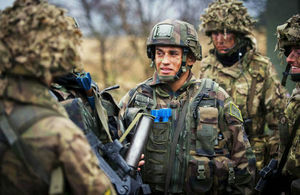 Exercise Griffin Rise, involving some 1,000 British and French personnel, will this summer be an important and visible demonstration of how mature this concept now is.